Lenovo unveiled 3 new members of Yoga 2 tablet family members with Yoga 3 Pro ultrabook. And I must admit that all the products same something incredible under their hood. The 13.3 inch version is named a Yoga 2 Pro with built-in projector. The 8 inch and 10 inch tablets have both Android and Windows running variants. The Yoga 3 Pro has 4 modes to meet all the demands you can imagine - Laptop, Stand, Tent and Tablet. The Yoga Tablet 2 Pro runs Android and packs a 13.3" QHD display. Its specialty is something unique. The tablet comes with an integrated projector, which allows you to beam the slate's display on up to 50" surface. It also has a 5W JBL subwoofer and two 1.5W front-facing speakers. This makes up for an 8W surround sound system, which promises to be quite good. You can also use the Yoga Tablet 2 Pro as a way to easily project presentations during meetings on the go, making it an interesting choice for business users. I almost think the business use case here makes more sense than the consumer choice, if only because of how difficult it can still be to connect tablets to standard projection systems. Since this is the latest slate in the Yoga family, it comes with cool stand allowing it for different viewing modes. In addition to the old Stand, Tilt and Hold, there's a new Hang mode which lets you hang the tablet on a wall, for instance. Under the hood of the tablet operates a quad-core Intel Atom Z3745 processor and 2GB of RAM. Internal storage is 32GB, while the microSD card slot allows for additional expansion of up to 64GB. 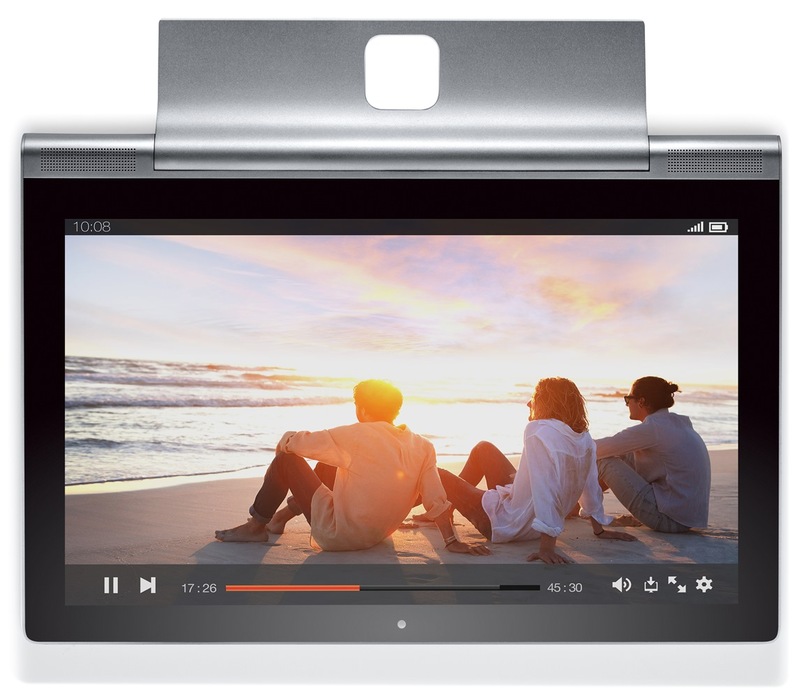 In terms of connectivity, the Yoga Tablet 2 Pro supports USB on-the-go, Wi-Fi 802.11 b/g/n (but no 802.11ac), Bluetooth 4.0 and LTE. At the back of the tablet, there's an 8MP f/2.2 camera with LED flash, while at the front 1.6MP 720p shooter takes care of video chatting. But I guess its not a very good news for the selfie lovers. The slate's battery is good enough for 15 hours of usage on a single charge. When in projection mode, the Yoga Table 2 Pro has up to 3 hours of battery life. All of these neat features have made the tablet quite heavy at 950 grams. Lenovo Yoga Tablet 2 Pro will be available from the end of October with the non-LTE model costing $499 which seems very reasonable to me. If you are impressed with the 13.3 inch version then Lenovo has more in their bag. Lenovo Yoga Tablet 2 family also comes in 8" and 10" versions; each one has both Android and Windows variants. The IPS LCD screens of the 10" and 8" models both have 1,920 x 1,200 pixel resolution, lower than the QHD screen of the Pro model but still fairly sharp in tablet terms – 226ppi and 283ppi respectively. 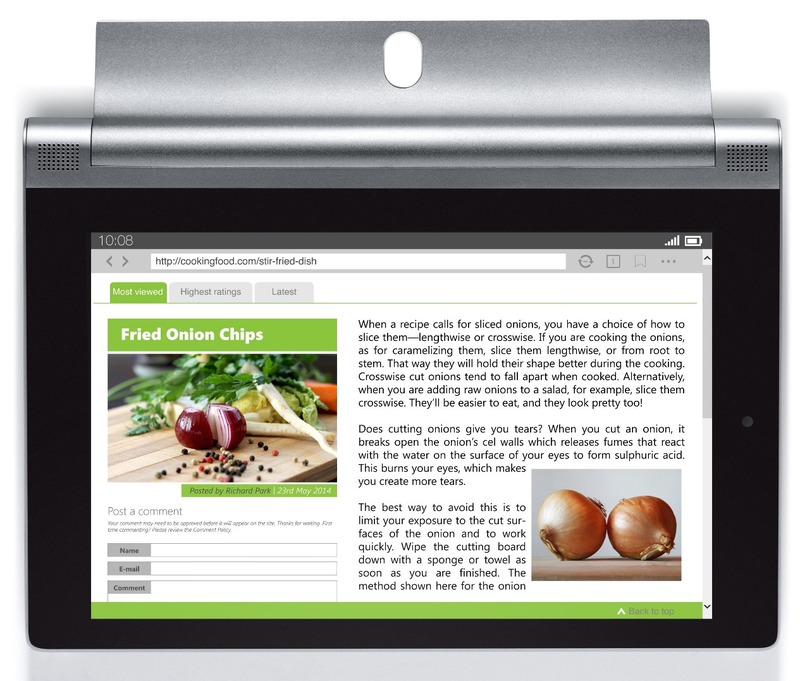 They are all powered by a quad-core Atom processor and share the Yoga Tablet's trademark kickstand. The new gen introduces the Hang mode – you basically hang the tablet like a picture. The three old modes – Hold, Tilt and Stand – are also possible. Inside the thicker bottom end of the tablet are stereo front-facing speakers by Dolby and Wolfson. The two Android tablets share in other specs too – like an 8MP f/2.2 auto-focus camera on the back and a 1.6MP selfie camera. They have 16GB of built-in storage and support microSD cards up to 64GB, plus you can attach USB On-the-go for more storage or accessories. The connectivity includes dual-band Wi-Fi b/g/n and Bluetooth 4.0. The 10" tablet has an LTE option available only in some countries but US is not on the list. The 10" Lenovo Yoga Tablet 2 measures 255 x 183 x 3-7.2mm and weighs 619g. The 8" model is 210 x 149 x 2.7-7mm and weighs 419g. The Android version is rated up to 18 hours on a single charge with the extended battery, while the Windows version is rated up to 15 hours. The Android version will start at $249.99 for the 8-inch version, $299.99 for the 10-inch model and be available beginning Oct. 9. 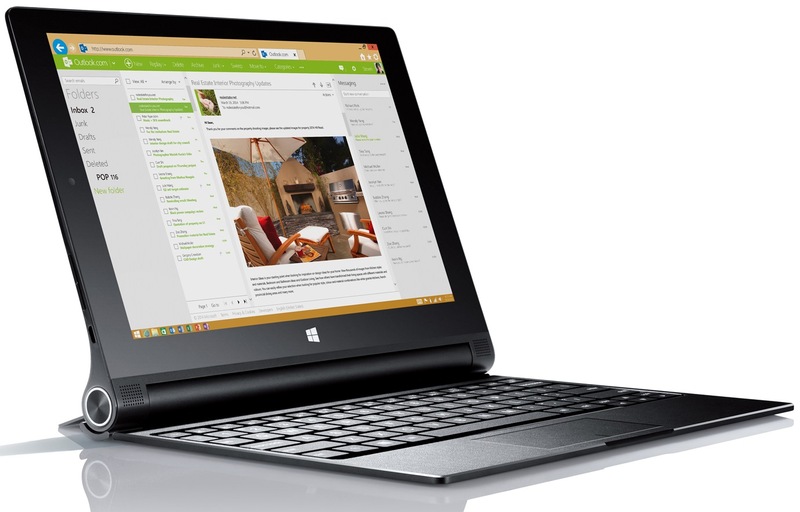 The 10-inch Windows model will be available for $399.99 in late October at Best Buy. The 8-inch variant will be available in November starting at $299.99.